It’s almost a year ago that we experienced Ireland’s most severe winter weather for over 30 years. Snowfall, blocked roads and queues for food – most people won’t forget the Storm Emma and the ‘Beast from the East’ anytime soon. But what some may not remember is that Ireland’s motorways actually remained trafficable throughout this period. So how did we manage? And what have we learned so we’re ready for next time? We keep a very close eye on the forecasts. Transport Infrastructure Ireland (TII), Atkins and contractors closely monitor weather forecasts, particularly during the winter season, with a view to planning for any significant winter events and ensuring the network is available and safe for the public to use. As soon as we see severe weather coming our way, we start contingency planning so we’re ready a week in advance of the event. If we see things getting worse, we can quickly mobilise additional resources in the days before the storm hits. We go outside when no one else will. While the public were being urged to stay indoors during the Storm Emma, the contractors and their staff continued their ploughing and treatments to ensure roads were trafficable. Additional drivers were sourced to ensure continuity. There’s a huge logistics wheel turning behind the scenes to make sure everyone working to keep our roads clear are safe and fed. We go out in force. 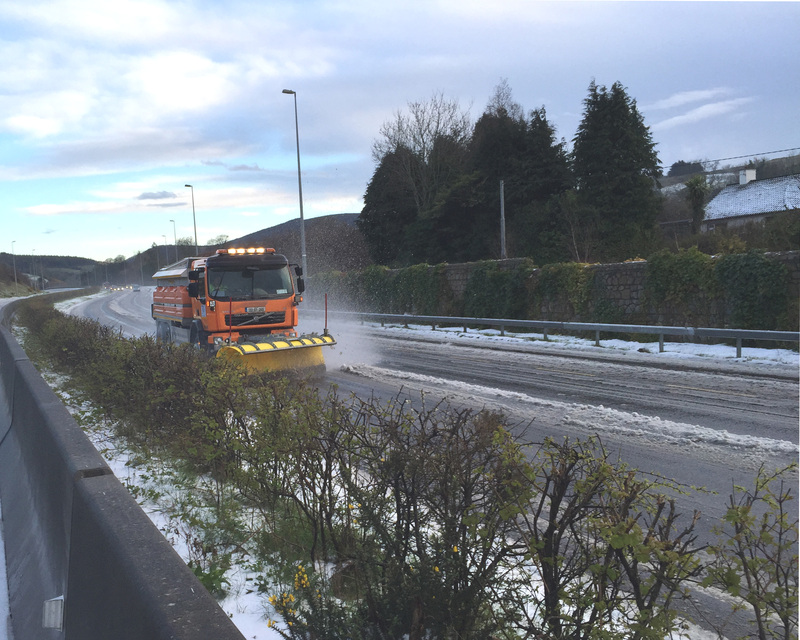 During Storm Emma, 92 gritters and 126 snow ploughs were out continuously treating and ploughing Ireland’s motorways. They ensured accumulations of snow didn’t build up on the network when traffic was light, and that the motorways remained trafficable at all times. It’s not just gritters and ploughs that are working throughout the storm – the key decision makers for all the organisations involved are on hand so that issues can be actioned quickly. This, coupled with the continual transfer of information between the organisations, makes sure TII have the information they need to make the right decision quickly, and provide the travelling public with accurate, timely data. Our teams are ready and well prepared for any severe weather that 2019 brings, with winter service plans and strategies have been updated following the lessons learned from Storm Emma, salt stocks have been replenished, and gritters and ploughs are fully serviced and ready for use. At Atkins we’re committed to continuing our work with TII and contractors to keep the motorways safe and running, whatever the winter weather may throw at us.